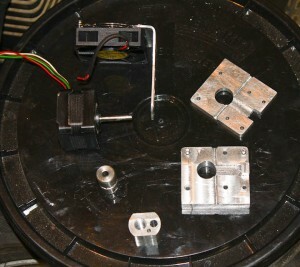 One of the corner angle mounts for my Reprep printer being made on my CNC machine. As a kid, I was a huge fan of Science Fiction Novels, but never did I really believe I’d see the day where I’d have a robot, that would make me another robot that could then replicate itself. I think one of the greatest things of our era is the ready access to programmable chips like the ATMEL ATmega series. These are the processors used on the very popular Arduino and Sanguino boards. 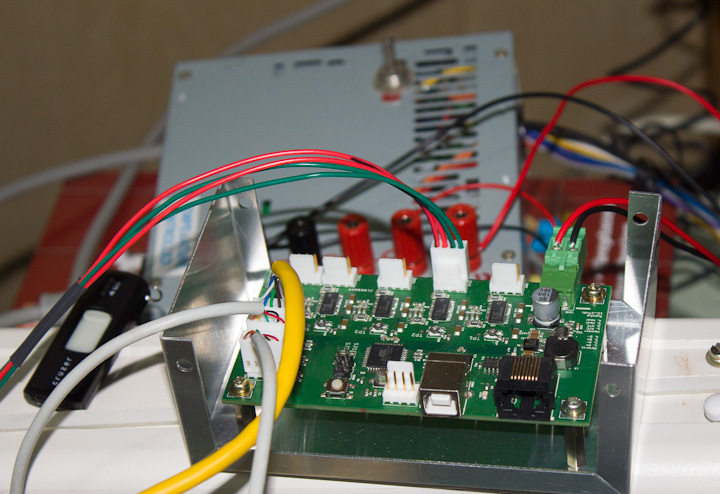 My Reprap will be powered by Sanguino running on an ATMEL atmega eventually. More on this topic in a later post. Today is all about showing bits and pieces of my reprap 3d printer. 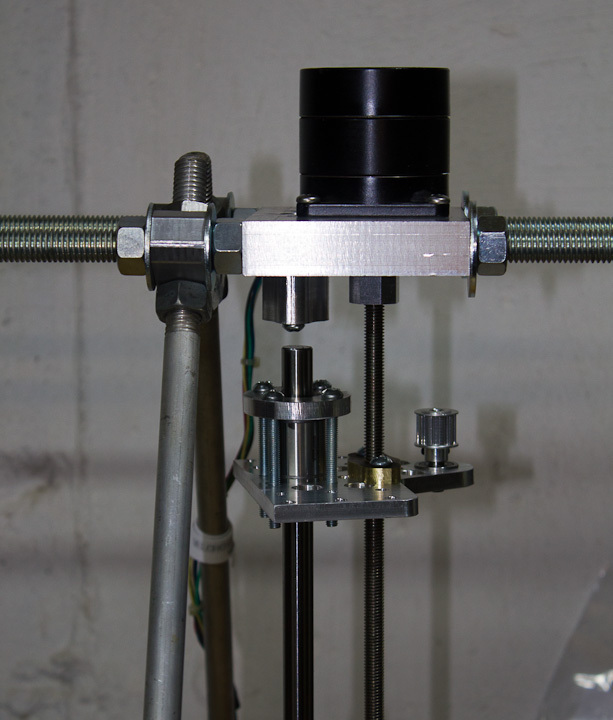 The Left picture shows the Y Axis set up. 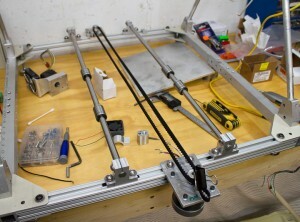 The build platform will be mounted to a carriage that runs on those four 12mm linear bearings that are seen in the picture running through the center of the chassis. I need to get a belt with 19 less teeth then my current or cut the belt and clamp both ends to the carriage (the 1/4″ aluminum square in the pic). The pic on the right shows the Z Axis as well as the drive motor on the X Axis. 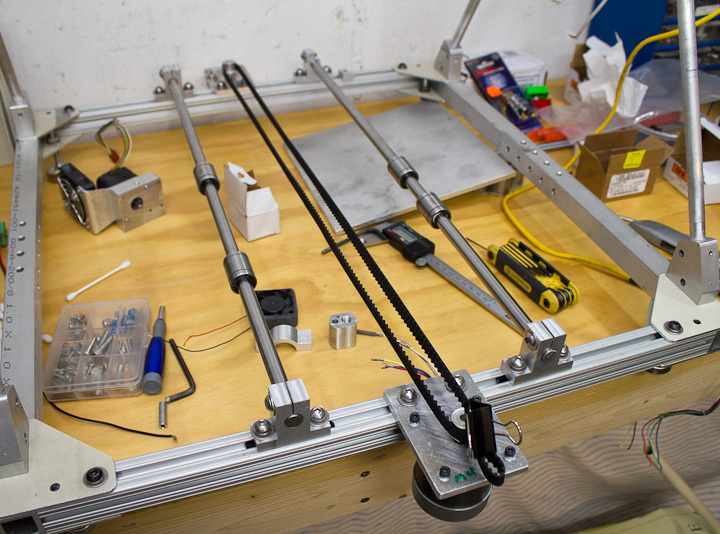 The X axis will have the stepstruder printing heads on a carriage moving on 4 8mm linear bearings. The left pic shows the idle side of the X axis as well as the other side Z axis. 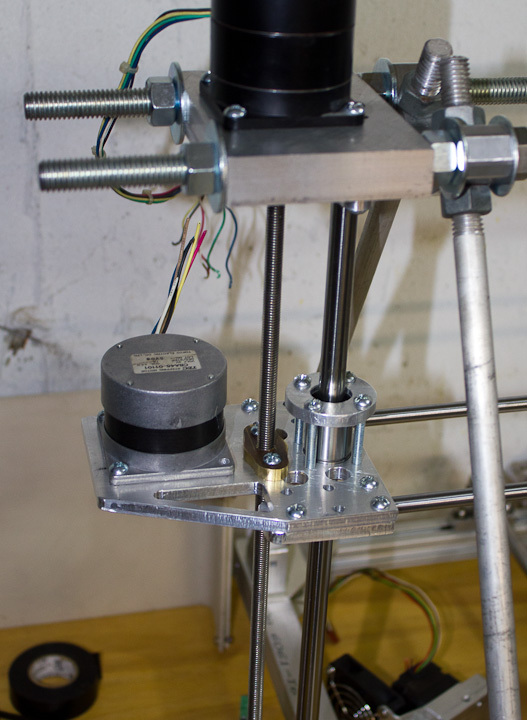 I chose to go with the dual stepper motor Z axis over the belt driven dual leadscrew set up. I have tested it with my zac built stepper driver set up run by a 555 timer pulse generator circuit to drive a pololu A4988 and it works well. I imagine I’ll have to check for lost steps and align the printer periodically with this set up. The right hand picture shows my milled stepstruder. It’s roughly based on the MK6 Stepstruder sold by Makerbot with some Zac-provements. 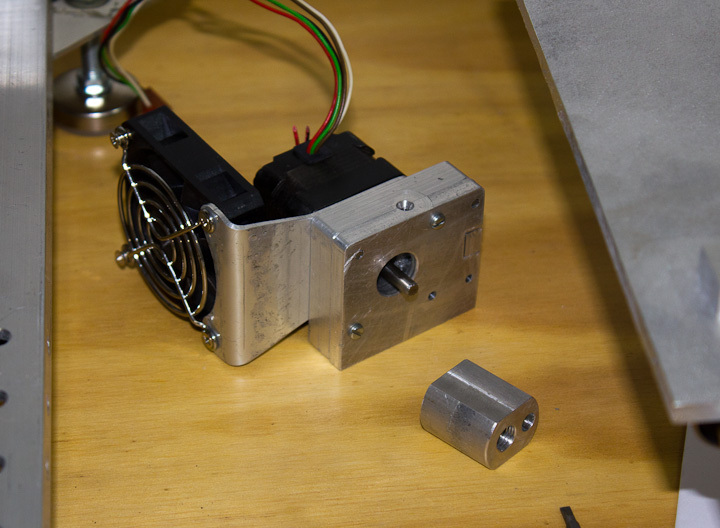 I still need to order a heater cartridge from them and machine the shaft, heat break standoff and some other pieces to finish the plastistruder unit. Eventually I hope to have a double extruder head set up so I can run a water soluble support material on one head and the build material on the other, or to do multicolor builds. This post will catch my readers up to speed on my 3D Printer project. It’s design is loosely based on the current RepRap Mendel and Prusa Mendel 3D Printer Designs. My goal was to build as much of my 3d printer from what I had on hand. I started this project back in May of 2011. I’ve been working on it in my spare time and having my CNC Mill do 95% of the manufacturing of components for this project. It’s been a good way for me to build CNC programming experience as well as test out the capabilities of my CNC milling machine (based on the popular RF-45 model Mill Drill) to determine Gen 2 upgrades needed to the CNC Mill. 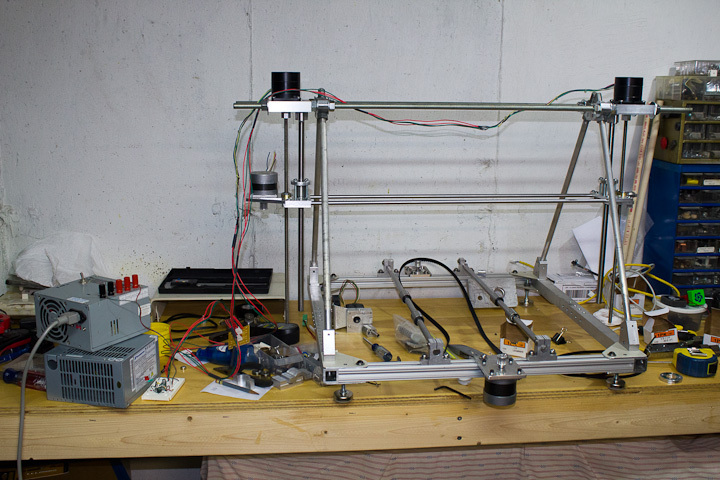 My Reprap project is partially inspired by the fact that I had a prototype Objet Alaris 3D printer for evaluation for work for 9 months prior to their launching of that product. It was mostly product testing and a bit of debugging for Objet but it gave me a full taste of having 3D printer access all the time. I still have and use many of the components I printed out for the house, my zacbuilt engine driven TIG welder, and of course in the Datsun and Mustang. 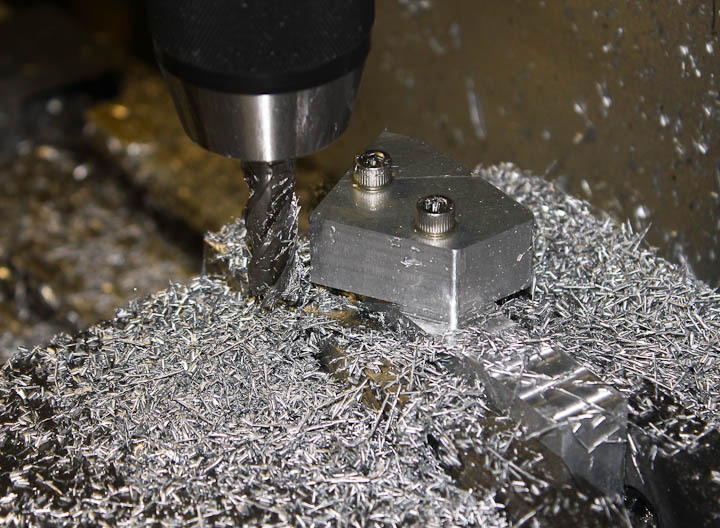 3d Printing, also often refered to as rapid prototyping, is the greatest thing to come along since the advent of CNC machining for the fabricator. It’s often faster to design a part virtually and just print it out then to try and make it by any other means. It’s a great way to test out crazy ideas, various styling changes, and tactile features of a design. 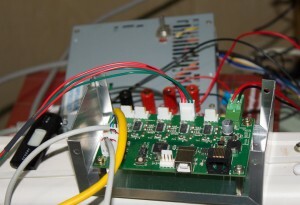 My RepRap 3D printer will be driven by Gen 6 electronics. This SMT board drives all three axis, and the stepstruder (aka plastic extruder printing head as shown in the right pic above) all in a small low power package. My first go at acquiring a Gen 6 board did not go so well and I ended up returning it. The board had numerous poorly soldered joints and one chip was floating off board at 20 degrees with several pins in the air. I since decided to finish the mechanical before reacquiring another Gen 6 board. By the time I’m ready to fire it up there might even be a better next Gen board design available. I think I’ll close this post here, I’ll share more about this project over the coming days to get caught up on where I am to date so I can move forward with the next steps.